In Jr Arimboanga's ninth-grade classroom, students learn about critical consciousness: how to read the word, but also the world. It's a concept popularized by a Brazilian educational theorist named Paulo Freire in his book, Pedagogy of the Oppressed. The class is ethnic studies. It's part of an effort by San Francisco educators like Arimboanga to teach courses centered on the perspectives of historically marginalized groups. Just last year, California passed a law mandating a model ethnic studies curriculum. Sometimes called multicultural education or culturally responsive teaching (though there are subtle differences among the three), ethnic studies has been expanding on the west coast and in pockets across the country. San Francisco's curriculum is "designed to give high school students an introduction to the experiences of ethnic communities that are rarely represented in textbooks," according to the school district's website. Teachers of ethnic studies argue that these courses give students a pathway to break the cycles of poverty, violence, and incarceration that so many communities of color face. "Ethnic studies works," says Artnelson Concordia, a veteran teacher who is helping to develop the San Francisco curriculum. He wants students to see that "all of their experiences can be connected to larger issues." "So by the end of the school year, they're seeing themselves as makers of history," Concordia says. Ethnic studies has "gained momentum, frankly, with the election of Donald Trump," says Ravi Perry, president of the National Association for Ethnic Studies. This summer, Oregon set a timetable for the adoption of K-12 ethnic studies standards. Efforts to introduce statewide legislation are also ongoing in Kansas and starting this year, Indiana high schools will be required to offer ethnic and racial studies as an elective course. States with large indigenous populations — like Montana and Alaska — have already written standards for culturally responsive teaching. "We have an obligation to ensure their heritage is aptly reflected in how we talk about America," Perry says. "This is not about promoting an individual agenda. It's about understanding the importance of community solidarity." Other movements are concentrated at the district level. Seattle has passed a resolution, based on recommendations from the NAACP. Students in Providence, R.I., have successfully lobbied for a pilot of the ethnic studies curriculum. Albuquerque, N.M., has launched ethnic studies courses in all of its high schools. Though the start of the ethnic studies movement can be traced to the early 1900s, it really kicked off in the 1960s at colleges and universities. In the past decade, the growth has accelerated in K-12 schools, partly in response to an Arizona law that banned the curriculum. There, Republican lawmakers were specifically targeting a Mexican-American studies program at Tucson High School — where minority enrollment is 88 percent. The Republicans who wrote the legislation, Tom Horne and John Huppenthal, claimed the classes were stoking racial tensions and "radicalizing students." They pointed to the course materials — among them, Freire's Pedagogy of the Oppressed and Rodolfo Acuña's Occupied America — as well as the class decor, which included a poster of Che Guevara. There were other ethnic studies courses in Tucson that were not touched by the bill, Huppenthal says. He mentions African-American studies, for one. But the teachers of Mexican-American studies classes at Tucson High, Huppenthal says, were "indoctrinating students." "They were doing a very simplistic application of Karl Marx's dictum: All of history is the struggle between the 'oppressor' and the 'oppressed,' " Huppenthal says. "And they were going to identify whites as oppressors and Hispanics as the oppressed." "One of the things you would hear was that our classes were hateful. That we were teaching resentment," says Curtis Acosta, who piloted one of the Mexican-American studies classes that sparked the controversy in Arizona. "That's exactly the antithesis of what you would see." Acosta taught for 18 years in Tucson Unified School District. On a typical day in his Chicano literature class, Acosta says, you'd find students sitting at tables "doing really controversial things like reading and writing well." "Students were sharing and taking risks and that didn't happen by accident," Acosta says. "It was real intentional." Alexei Marquez can attest to that. She was in Acosta's class the first year it was offered. Up until then, she had been a dutiful, if disengaged, student. "I learned from an early age to play the game as it was," Marquez says. 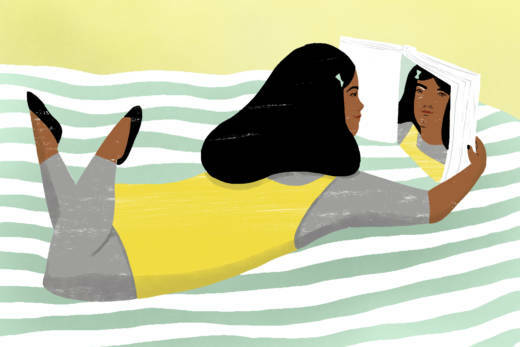 When she took Acosta's class, it was the first time she'd connected to literature on a personal level. She fell in love with The Devil's Highway by Luís Alberto Urrea. "I can't even tell you what I read in AP English," Marquez says. She is starting her PhD in Educational Leadership and Policy at the University of Arizona. And she is not a lone success story. While 48 percent of Latino students were dropping out of high school, 100 percent of those students enrolled in Mexican-American studies classes at Tucson High were graduating, and 85 percent were going on to college. "The research says, plainly, that this stuff works," explains Christine Sleeter, a California State University professor and ethnic studies expert. In 2010, the National Education Association asked her to review the academic and social impact of ethnic studies. A few things happen when students take courses that connect with their lived experience, Sleeter says. Engagement increases, as do literacy skills, overall achievement and attitudes toward learning. "As students of color proceed through the school system, research finds that the overwhelming dominance of Euro-American perspectives leads many such students to disengage from academic learning," Sleeter writes in the NEA report. "Ethnic studies curricula exist in part because students of color have demanded an education that is relevant, meaningful, and affirming of their identities." Something else happens in these classes: students develop "a sense of agency," Sleeter writes. So they aren't just learning about history, they're engaging with it and shaping it — reading the word and the world. A Stanford study finds similar outcomes — particularly for high school students at risk of dropping out. Taking a course which examines "the roles of race, nationality and culture on identity and experience" improved not only academic performance, but also attendance. "Kids react when the curriculum isn't speaking to their experiences or to the things that really matter to them," Sleeter says. "They just get bored and they either intellectually drop out or physically drop out." A federal judge will rule any day now on whether GOP state officials violated students' constitutional rights when they all but abolished Tucson High's Mexican-American studies program. For the main players, this trial has stirred up a lot of old emotions. Huppenthal has held steady, maintaining that ethnic studies racializes the classroom. "To teach kids that they're victims and they can't get ahead in life because somebody's holding them down, I think it's a mistake," he says. But that argument — that the world is a meritocracy, free of systemic racism and colonialism — is detrimental to students of color, according to a new study in the Child Development journal. Acosta, who lost his class to the ban, has been helping other districts integrate ethnic studies into their schools. No matter what happens, he says, the legacy of Tucson's Mexican-American studies program remains. "As emotional as this has been, what's really fascinating and affirming is that ethnic studies is now something seen," Acosta says. "And can be used to resuscitate hope."